Here's the second part on the Playing In and Out of Position theme (part 1 is here). This exercise will help us develop the ability to navigate up and down the neck (horizontally) and not get stuck in position. To play a 1-octave Major scale, we generally need 3 or 4 adjacent strings, so that we can play the entire scale within a same position. Here, we are going to limit ourselves to only use 2 adjacent strings: this will force us to shift to a higher position in order to complete the scale-- hence the challenge. For all of the examples on the video, we will start with F on the second string (6th fret) and finish with F on the first string (13th fret). The tricky part is to keep all the notes as even or as long as possible, and make the shifts as smooth as possible. Easier said than done! Once you can do those exercises comfortably, try applying them to other adjacent strings: strings 2 & 3, 3 & 4, 4 & 5, and 5 & 6. Questions? You can send me a message through “The Guitar Channel” (see below) or contact me directly through my website: brunojazz.com. If you are looking for an excellent Jazz guitar teacher, I highly recommend Bruno. He produced many Jazz chronicles in French for La Chaîne Guitare which were highly appreciated by the Backstage Pass subscribers. 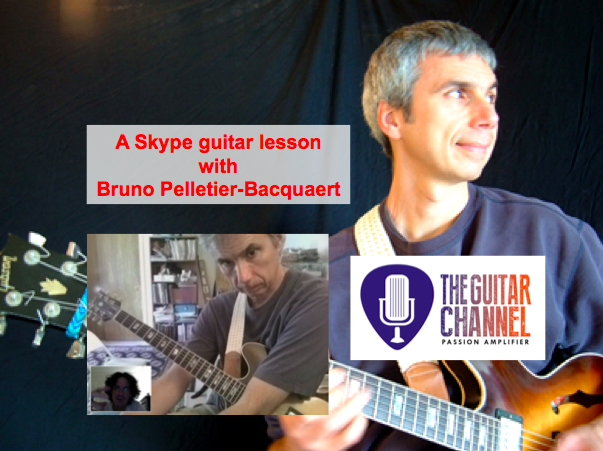 I also took a Skype lesson with him once (read the story about it in this article) and it was a lot of fun and very useful to help my play better and increase my vocabulary on guitar. 200th Backstage Pass activated: thanks!